Subscribe to the publication that, once a month, in issue after issue, bridges international, industry, defense and government sectors to deliver the insider's perspective directly to you. SIGNAL integrates the technical, marketing, research and business aspects of electronics in an entertaining and informative format. In today's market, you cannot afford to be without the best information on business trends, technical advances, government and military programs, contract awards, research and development and state-of-the-art information systems. If you do not see SIGNAL regularly, the opportunities you miss are gone forever. SIGNAL will provide you with powerful technology and late breaking news that you need to ensure a winning strategy. When you subscribe, you will quickly find out that the editorial material in SIGNAL works for you and with you. A subscription to SIGNAL saves you nearly 42 percent off of the newsstand price. Subscribers can request prorated refunds based on the remaining term of the subscription. A $5 processing fee will be applied. Digital subscribers must login to the AFCEA portal to access the current issue. New subscribers will receive an email with the login information. If you need any assistance accessing your account through the portal, please contact our Customer Service Department at 703-631-6158 or email. 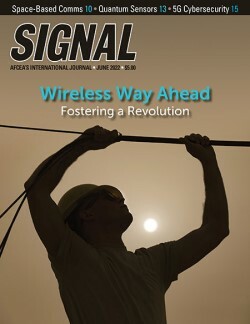 SIGNAL Magazine is available in the Apple, Google and Amazon app stores. Proceeds from the $1.99 download fee go to the AFCEA Educational Foundation. You must be a subscriber or AFCEA member to receive the magazine once you have downloaded the app. Click here for more information. A single copy of SIGNAL: $5 plus $2 shipping and handling for the first copy. Add $1 shipping and handling for each additional copy. A single copy of SIGNAL: $5 plus shipping and handling. Please email copy quantity and destination country to obtain accurate shipping cost. Prepayment is required. Allow 15 working days for delivery.